Like Hassan, the shy and reticent masseur he played in his debut film 1947 Earth, Rahul Khanna is a man of few words. Sitting at a posh coffee shop in South Mumbai, where ForbesLife India meets him for a freewheeling chat, the VJ-turned-model-turned-actor takes his time to choose his words carefully. But when he speaks, a few sentences to each question, the articulate style icon turns heads with his clarity of thought, just like he does on screen, playing the suave Yousaf Rana in The Americans, an espionage series set in the Cold War era. Despite father Vinod Khanna being a Bollywood star, Rahul Khanna never grew up as the “star child”. His introverted nature is reflected in his aversion for all things flashy; instead his wardrobe is replete with pieces that are classic and “conservative”. “I want a long-term relationship with my wardrobe. I love the idea of savouring pieces by reusing them over and over rather than discarding them after just one or two outings,” says the 43-year-old. 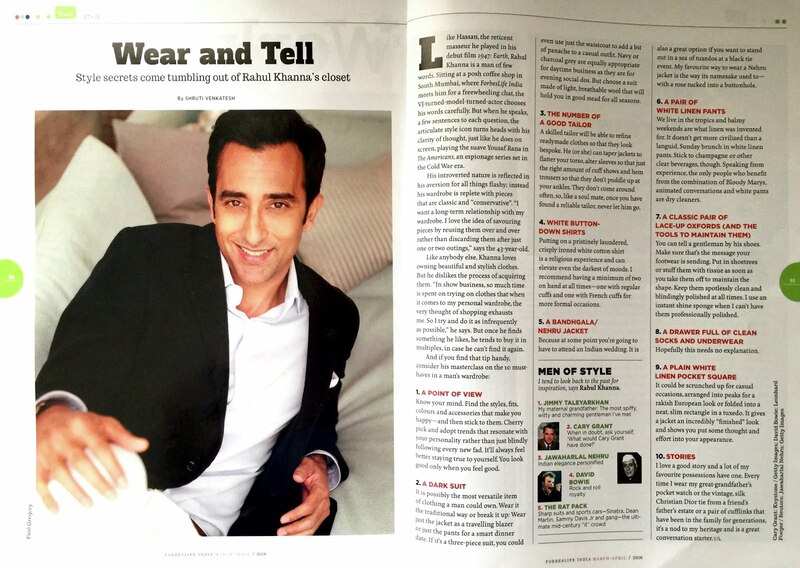 While Khanna loves owning beautiful and stylish clothes, he says he dislikes the process of acquiring them. “In show business, so much time is spent on trying on clothes that when it comes to my personal wardrobe, the very thought of shopping exhausts me. So I try and do it as infrequently as possible.” he says. But once he finds something he likes, he tends to buy it in multiples, in case he can’t find it again. I don’t think there should be “rules” when it comes to style, but here are 10 essentials I feel every man’s wardrobe could benefit from. Know your mind. Find the styles, fits, colours and accessories that make you happy—and then ruthlessly stick to them. Cherry pick and adopt trends that resonate with your personality rather than just blindly following every new fad. It’ll always feel better staying true to yourself and, when you feel good, you look good! Possibly the most versatile item of clothing a man could own. It is the sartorial Swiss Army knife. Wear it the traditional way or break it up and wear just the jacket as a travelling blazer or just the pants for a smart dinner date. If it’s a 3-piece suit, you could even use just the waistcoat to add a bit of panache to a casual outfit. Navy or charcoal grey is equally appropriate for day time business situations as it is for evening social ones. Choose a suit made of light, breathable wool that will hold you in good stead for all seasons. Putting on a pristinely laundered, crisply ironed white cotton shirt is a religious experience and can elevate even the darkest of moods. While I firmly believe there is no such thing as too many white shirts, I recommend having a minimum of two on hand at all times—one, with regular cuffs, that you can fold up, if necessary, and one with French cuffs for more formal occasions. A skilled tailor will be able to refine readymade clothes so that they look bespoke. He (or she) can taper jackets to flatter your torso, alter sleeves so just the right amount of cuff shows and hem trousers so they don’t puddle up at your ankles. They don’t come around often, so, like a soul mate, once you have found a reliable tailor, never let him (or her) go! Because at some point you’re going to have to attend an Indian wedding! Also, a great option if you want to stand out in a sea of tuxedos at a black tie event. My favourite way to wear a Nehru jacket is the way it’s namesake used to—with a rose tucked into a buttonhole. We live in the tropics and balmy weekends are what linen was invented for. It doesn’t get more civilized than a languid, Sunday brunch in white linen pants. Stick to champagne or other clear beverages, though. Speaking from experience, the only people who benefit from the combination of Bloody Marys, animated conversation and white pants, are dry cleaners. Hopefully this needs no explanation. Scrunched up for casual occasions, arranged into peaks for a rakish European look or folded into a neat, slim rectangle in a tuxedo, it gives a jacket an incredibly “finished” look and shows you put some thought and effort into your appearance. You can tell a gentleman by his shoes. So, make sure that’s the message your footwear is sending. Put in shoetrees or stuff them with tissue as soon as you take them off to maintain the shape. Keep them spotlessly clean and blindingly polished at all times (I use an instant shine sponge when I can’t have them professionally polished). I love a good story and a lot of my favourite possessions have one. Every time I wear my great grandfather’s pocket watch or the vintage, silk Christian Dior tie from a friend’s father’s estate or a pair of cufflinks that have been in the family for generations, it’s a nod to my heritage and a great conversation starter. Sharp suits and sports cars—Sinatra, Dean Martin, Sammy Davis Jr. and gang—the ultimate mid-century "it" crowd. When in doubt, ask yourself, "What would Cary Grant have done?" The most spiffy, witty and charming gentleman I've met.